A Facebook friend pointed me to this article. If you’re fat in Japan, you’re breaking the law. The government there is mandating that companies reduce overweight employees in 2012 by 10% and 25% by 2015. This is a good example of government begetting more government. This means that a previous government intervention caused problems. That fact goes unrecognized, and it is believed that more government intervention can solve it. The idea of undoing the previous government intervention to fix the problem doesn’t get much play. In this example, the initial government intervention was government health care. This weakened incentives for individuals to take care of their health, since they won’t have to pay directly for the medical care resulting from their poor health. Of course, you might retort, That’s not a big incentive. Taking care of yourself so you can live a healthy life is incentive enough. That sounds good, but let’s consider a benign example. Let’s say you have borderline high cholesterol that could be addressed by diet and exercise or taking a cholesterol lowering medication that has a real cost of $150 per month, of which you pay $10 and insurance or government pays $140. If you paid the full cost for that medicine, you may be more inclined to modify your diet and exercise habits. But, for $10 a month, you feel it’s worth it to make no behavior modification. So, one approach to improving health is to put more of the individual incentives back on the individual. In this case, the individual could be given the choice to pay the $150 per month or modify their diet. Despite what we want to believe, incentives do matter. Either way saves $140 per month of taxpayer money. But, this approach is rarely taken. Bureaucrats almost always opt to give themselves more to do. The next wave of government intervention in this example is the mandate lower the percent of overweight people. Do they not consider this option? Do they think it sounds harsh (harsher than controlling other peoples behavior because you think you’re paying for their benefits?)? Or, are they concerned that saying this may lead to paying for their own health care? And, if this last question is right, is it because they don’t feel like they take good enough care of their own health? After a once-in-300-years earthquake, the Japanese have been keeping cool amid the chaos, organizing an enormous relief and rescue operation, and generally earning the world’s admiration. 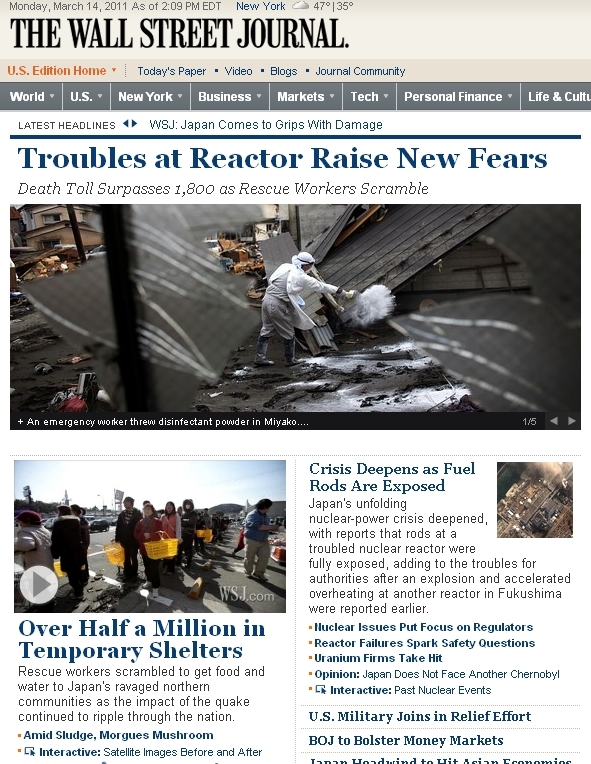 We wish we could say the same for the reaction in the U.S., where the troubles at Japan’s nuclear reactors have produced an overreaction about the risks of modern life and technology. Part of the problem is the lack of media proportion about the disaster itself. The quake and tsunami have killed hundreds, and probably thousands, with tens of billions of dollars in damage. Now, I’m no nuclear Luddite. But with many things I’ve learned to be skeptical, especially of what we don’t know. The benefits of nuclear power are great. The costs can be too. After reading about the Japanese quake and the collapse of a building at the nuclear power facility this morning, then reading about the NFL players disbanding their union (i.e. monopoly over player talent) so they could take the NFL owners to court over their “monopoly” of a valuable sports league, the latter seemed awfully trivial. Second, after reading about the problems at the nuclear facility after the Japanese earthquake, I wonder if the folks who support nuclear power as a cheap and safe energy source are revising their thinking. Third, after seeing some of the best video yet of an earthquake and the resulting tsunami, my awe of the powers of nature and appreciation for the relative calm our planet has had for the past several thousand years or so are rekindled.